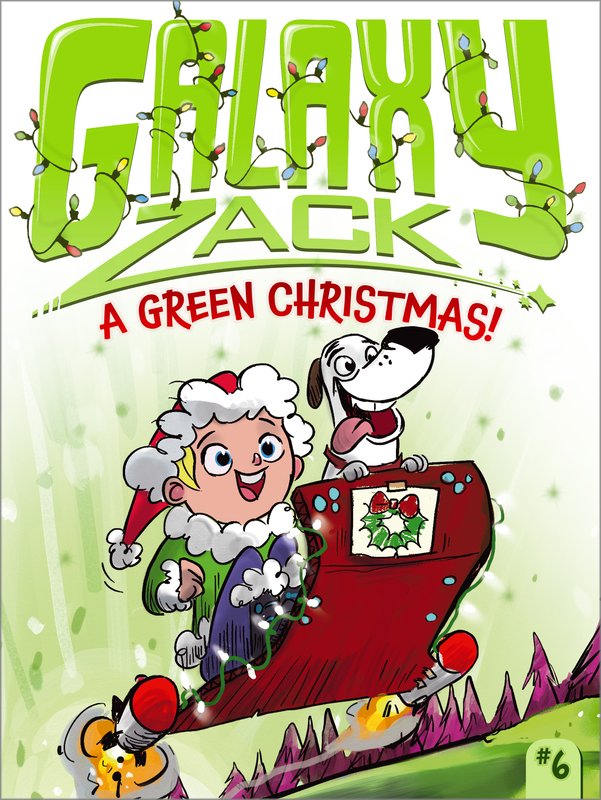 Zack wants to go back to Earth for a white Christmas—but it turns out a green Christmas is just as cool! Christmas is just a few days away and Zack Nelson can’t wait to get back to Earth and spend it with his relatives in Vermont. He’s looking forward to sledding and having a white Christmas! But when a cosmic storm hits Nebulon, the Nelsons have to cancel their travel plans and spend Christmas on their new home planet. Zack is distraught....until the storm hits. What are those green flakes falling from the sky? Could they be...snow? A white Christmas would have been nice, but maybe a green one is even better! Zack Nelson stretched out on his bed with his dog, Luna, beside him. He clutched his hyperphone and punched in the z-mail address for his cousin Louis on Earth. Christmas was coming, and Zack was already on his school break. Zack was born on Earth. He had spent the first eight years of his life living in Dubbsville, Texas. But Zack now lived on the planet Nebulon. Zack and his family had moved to Nebulon several months ago. At first Zack missed Earth very much and he wished he could go back and live there again. But Zack had grown to really like his life on Nebulon, even though he still missed his friends and family on Earth. As Zack’s hyperphone blazed to life, his cousin Louis’s face appeared on the screen. “Begin video chat,” said a computer voice from the device. “Hey, Zack! How’s life on Nebulon?” asked Louis. This would be Zack’s first Christmas since his family moved to Nebulon. But Zack, his mom and dad, and his twin sisters, Charlotte and Cathy, were planning on traveling back to Earth. Zack loved spending Christmas with his relatives. Louis and his family lived in Vermont, and Zack always looked forward to sledding and building snowmen with his cousins. “And without you!” Louis added. “Do they have Christmas on Nebulon?” Louis asked. Just then Louis held his hyperphone up to his bedroom window. “Look!” he said. Zack saw what was happening outside: White snow was falling gently on the Vermont mountains. Ruff! Ruff! Luna barked excitedly. Book Cover Image (jpg): A Green Christmas!